I grew up in New York City where art is everywhere, and I was exposed to it all by my mother who had a background in the arts herself. Visiting museums, galleries, the theater and the ballet was how we spent much of our time together. My mother was also an artist, working in a variety of mediums but mostly making documentaries during my younger years, and so I was exposed to that side of things as well. While she was pregnant with me, she made these incredible black and white dance paintings where she would put black acrylic paint on her feet and then sashay and glisse across the canvas, writing in the names of the dance steps (she was trained in ballet) along the way. They're striking. After receiving my B.A. in Art History from Emory University, and my M.A. in Art Business from Sotheby's in London, I worked briefly at Sotheby's in New York before moving to the financial world to help hedge funds raise money for many years. Though exciting to be young and try my hand at various things, I was ultimately led back to the arts because of my passion for it. I got my start by working for several years with a wonderful, very experienced dealer in the city, who sells works by renowned artists such as Pollock and Twombly. During that time, many younger people approached me looking to develop their collections but in a more accessible way. And that's how I began advising. There are a lot of great advisors. Ultimately it is a personal choice but I like to think that I am good at really listening to my clients, and helping them interpret and execute their own aesthetic which is sometimes hard for them to articulate. I'm also continuously working to ensure that I stay current, to know who the exciting artists are now and more importantly, who they will be in 5 to 10 years. Longevity comes from connecting with clients and having your finger on the pulse of the market. I love working with people and I love art. Hopefully that leads to longevity. I try to give my clients exactly what they want. Some clients love the process. Going to galleries, exhibitions, fairs. Always wanting to see what's new and exciting. Other clients want the process to be efficient-they want to see options that fit their criteria and get it done. Installation days! I love seeing a work installed in its new home, and how it transforms the space. And how happy my clients are when they see it all come together. Also, discovering new artists, visiting their studios and showing their work to my clients for the first time. That first moment when they see a piece that they truly love. The shop at the MOMA. Filled with amazingly creative, fun and unique items of every kind. Go there if you need a gift this holiday season for that person who has everything. I'm actually crushing on one of the Roy Lichtenstein umbrellas in case anyone that I know is reading this. Art enhanced my childhood so tremendously that I like to pay it forward. Lots of my mom clients want to educate their children about art but don't know exactly how. I'll often invite moms and their kids to join my kids and me, at a museum or gallery. I'll discuss the art and make it fun. My goal is to get the kids to pay attention to the details, as the ability to look beyond the surface of things translates on so many levels. And, I want to teach them about the power of expression-that there are many ways in which a person can express themselves. This creative aspect of the arts is very different from the "right or wrong" of other academics, and it really encourages children to think outside of the box. Even the little kids are absorbing! My 4 year old son turned to me this week while reading a book that showed a picture of a painting and said, "Mom, that's figurative!" Validating moment. Since we're talking today about moms and kids, the following comes to mind. One family was recently choosing among a series of photographs for their kitchen-a row of three images was to go above their table. They decided to give each of their children a vote as to their favorite images. They all sat around, said their first three choices and why, and the ones with the most votes were the chosen images. The mother came to me with their decisions, and told me how much fun it was to listen to the rationale from their kids as to why they chose each work. 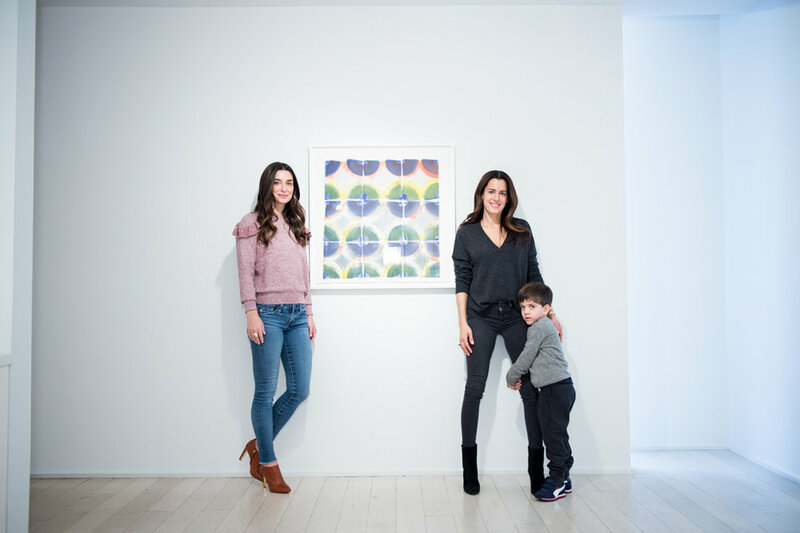 Of course parents cannot allow all decisions to be made with consult of the kids, but as the images were all pre-selected and loved by the parents, it was a great way for the kids to feel connected to the art in their home. I adore Erica Samuels (Samuels Creative)-she brings a wealth of knowledge to the table, and is a good friend. Also Lindsay Taylor (Taylor Art Advisory)-she has a great eye. What is the best advice anyone's ever given you? Or what is your "mantra"/words to live by? I'm constantly thinking about life balance, and how to achieve it. But some weeks are more balanced than others. I try not to let the off-balanced weeks get me down, and look at each week ahead as a chance to try again. As a mom of three young boys, I'm always on the run. If I have to run out of the house with damp hair, I throw on a hat that pulls over my head. It helps my hair to "sit" down while it dries and not be as frizzy afterwards!